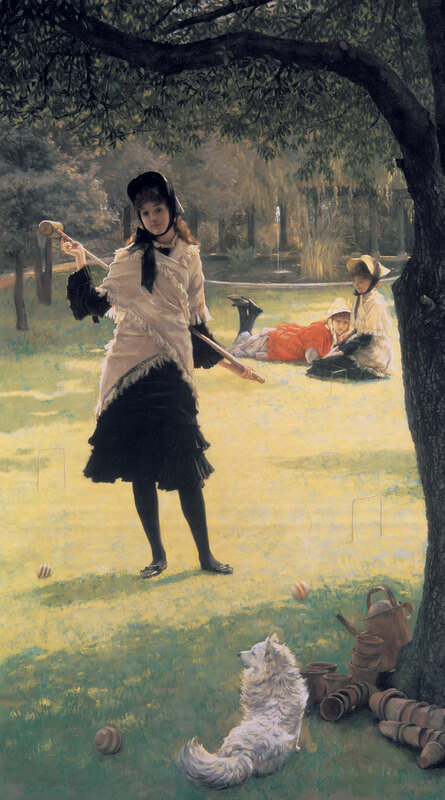 James Tissot (French 1836-1902),Croquet c. 1878, oil on canvas. Gift of Dr. and Mrs. Basil Bowman in memory of their daughter Suzanne, 1965 Art Gallery of Hamilton. HAMILTON.- Complementing the Gallerys series of Asian shows, this intimate exhibition explores the influence of Japanese art on two of the great French realists of the 19th centurythe Impressionist Edgar Degas (18341917) and the Victorian realist James Tissot (1836 1902). Friends from their student days, Degas and Tissot were inspired by the special forms, colours, and motifs of the art of Japan, in particular Japanese woodblock prints. The Japanese influence melded with other sources of inspiration, such as photography for Degas and the popular fashion plate for Tissot. This thematic exhibition highlights the original japonisme of each artists work by juxtaposing a select number of paintings and prints, including Degas loans from the National Gallery in Ottawa and the Montreal Museum of Fine Arts, and the AGHs beloved painting by Tissot, Croquet.